The DCCC ad is certainly guilty of ommission, and is not accurate as to the 30% rate that retail merchants have to add to their costs in order to arrive at a 23% tax inclusive price. The ad also said that we can’t afford the Fairtax, but that claim doesn’t apply to everyone. Certain retired and minimum wage earners would see their net taxes increase under the Fairtax, but many other workers would be better off. But, how much detail can one put in a 30 second ad? Dutchman, in this post, is hardly being more candid with you than the DCCC. 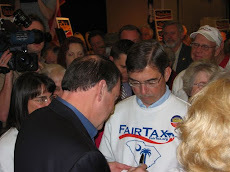 He has agreed with me in prior posts on other sites that there are offsetting factors under the FairTax tax, but he has not expounded on them. For example, the FairTax will lower pre-tax prices on goods and services by removing the built-in tax cost component. While the exact percentage varies by industry, Dutchman and I agree that this drop can generally be up to 10%. To keep prices from jumping on Day One of the FairTax, there is also an inventory credit. The easy way to remember this is that competition is a price ceiling; costs are a price floor. When you drop the floor, the ceiling can drop, too, in any industry where there is elasticity of demand. 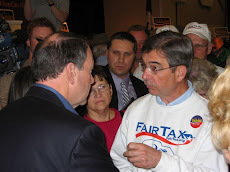 Since both of us accept the premise that there can be a 10% tax cost savings due to the FairTax, nominal prices would increase, on a one-shot only basis, 17% over what they are today. But wait, most people will be relieved of income and payroll taxes and will actually have more purchasing power. Dutchman is a retiree and is advocating for his narrow interest. Those who do so lose sight of the fact that Social Security is over $6.6 Trillion in the hole, and Medicare is over $36.3 Trillion in the hole. The hole is deepening automatically by over $2 Trillion every year nothing is done. Ask the DCCC and Dutchman what they plan to do about that. The FairTax addresses those problems by switching Social Security and Medicare to a larger, more stable and growing tax base. Dutchman allowed for the fact that many workers under the FairTax would be better off. He was wrong about minimum wage earners, but let's not quibble. The DCCC intentionally left that part out in order to be slick. The DCCC, and to a lesser extent Dutchman, need to come clean and tell you the whole story. The attack ad certainly displays ignorance!